Perfectly in sync with my teenage years, Skins featured rebellion in a validating way. 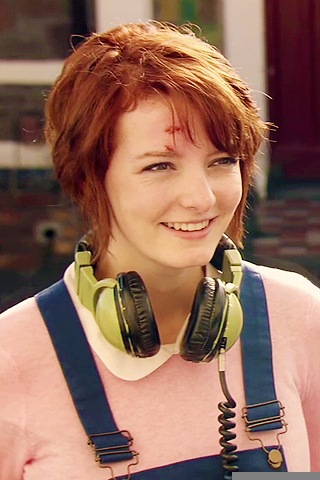 Dakota Blue Richards plays Franky Fitzgerald from generation three: an adorably freckled, androgynous, and complicated character. Quite dapper and often wearing formal attire, she either keeps her hair gelled back, or allows it to be scruffy and flyaway. Her style is grungy, yet reminiscent of the Mods, the British music subculture from the 50s. In her introductory episode, we see Franky dress and undress several times. At first, into an outfit of her choice, in preparation for school — black slacks, a black turtleneck sweater with thumb holes, and a Royal Stewart tartan dress shirt. Elevating herself with white Creepers, she hangs black rope-wire headphones around her neck — an outfit staple. Baring in mind that the season came out in 2011, it is certainly heavily implied — and in some ways articulated by Franky herself — that she rejects socialized femininity, but gender identity questions are either inaccessible for her, or not articulated well to the audience. As she walks through the locker room, the anxiety builds on her face. When she ultimately removes the outfit that she chose to dress in, revealing boxers, her femme classmates laugh and comment. After proving to her toughness in the face of bullying, the girls invite Franky to hang out, and she goes shopping with her new friends after school. She tries on black eyeshadow, which she seems to like. Then, perhaps with the newfound confidence from the make-up, her friends convince her to try on a black sequined dress. Before she even steps out of the dressing room, you see her squirming within it. When she steps out, she tugs at it and says, “It’s not right.” Her friends give her positive affirmation toward how she looks, but Franky’s lack of enthusiasm seems to come from a place beyond aesthetic attractiveness. In getting ready for the next day of school, Franky begins to compromise her style. She wears the black eyeshadow, and exposes more skin, wearing black board shorts and a graphic tank top with layered necklaces. She continues to get grief; her new friend Mini tells her that she won’t be allowed to come to her party unless she wears the dress. Franky is consistently prodded at for answers about her sexuality, which she never responds to, until finally she feels comfortable with her new friends, she explains that she just likes “people.” After the writers built sexual tension between her and Mini, she only has sexual relationships with male characters. Pansexual and bisexual representation in media often follows this pattern with FAAB characters, even toeing the line of fetishization, but for Skins, it just sort of seems like they gave up. Although, the show takes place only over the course of two years in high school, leaving the future (and past) of her sexual life ambiguous. Throughout the rest of the season she created some more amazing outfits: pinstriped pants, brogues, blazers, and button-downs. She has layered looks for every season! When season six comes out, Franky’s style completely changes. I read this change as a visual depiction of a change in her personality as well. Things in her life have changed, due to different romantic entanglements, she hangs out more with Mini, and is not as close with Alo or Rich (the boys she was hanging around with for most of the previous season) who always accepted her. Still, her change in style of clothing feels like self-betrayal, considering how adverse her reaction had been to the hierarchy of female sexuality throughout the show. Yet, here’s Franky, in a black-trimmed, bright red, scoop neck tank mini-dress — even heels! Although her adoptive fathers have always been supportive of her, in season 6 there’s more focus on her issues of abandonment. Having been adopted as an older child, she has memories of her mother, and her siblings. She struggles to really feel connected with anyone except Mini. She stops gelling her hair, letting it fall about her face asymmetrically. She’s traded in her triadic color schemes with bright, contrasting neons, and she’s still into plaid patterns and blazers, but she’ll also don a sundress or two, floppy skirts, and tank tops. Franky is in an unstable place after the loss of her friend. Her desire to be accepted by Mini indicates to me that much of the way she dresses is performative. Plus, Franky is living at her house for most of this season, and is perhaps just wearing a lot of Mini’s clothes. Either way, this speaks to the fluidity of gender as well, whether or not it’s just be a pubescent desire to be noticed, it’s a statement of sexuality. Franky and Mini end up running away together and briefly living in a women’s shelter. The lack of stability played a huge part in dismantling the connection that they had made, and the friends went back home to separate houses. Nearing the point of mental breakdown, Franky begins a journey of self discovery, and attempts to find her birth mother. Part of what makes growing up so scary is the prospect of needing to define yourself right away, and exploration is key to finding who you are. While Franky’s gender identity is never officially discussed, it’s flexible and complicated. Not all representation is perfect, but what made her character complicated is also what made her relatable. It was still validating to see this androgynous person, without defined preferences or even a fully defined identity. Ash Richter is a writer, artist and musician that studied creative writing at Lesley University. Their poetry and art is featured by local band, Total Wife, who are working on their third full-length studio album. In their creative pursuits, they always felt capable of honestly expressing their queer identity. Besides writing poetry and fiction, Ash has written nonfiction articles for online zines, covering events and releases in music and visual arts. Some of their work can be found through ma-richter.tumblr.com. Jan 19 Qwear to speak at SXSW and More!